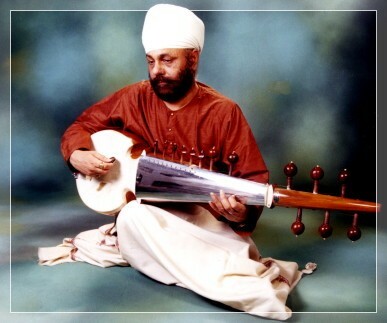 GURDEV SINGH is one of the world's foremost exponents of the Sarod. He is the leading disciple of Ustad Amjad Ali Khan and is now becoming well known internationally through his performances in the USA, Canada and the UK. Born on 15 January 1948, and brought up in a remote vil­lage in Harayana, North India, Gurdev Singh began learning music at the age of seven under Ustad Tara Singh and Piara Singh who taught him Dilruba, a bowed instrument of great antiquity, which Gurdev still plays occasionally. He is also trained in vocal music under Pandit Mahadeo Prasad. Gurdev Singh has now spent over thirty learning to master the Sarod. His success can be measured by his popularity in India, in both live and radio concerts, and by the increasing international demand for his performances, especially in the UK, which he has now made his home. His UK performances have included the BBC, Midland TV, and the Edinburgh Fringe Festival, the Bhartiya Vidya Bhavan, Bath and Oxford Universities, the 1984 Liverpool Garden Festival and South Bank. In North America he has played in Vancouver, New York, Los Angeles, Seattle University and at the prestigious Amir Khusro Society in Chicago and has also visited Switzerland, Denmark, and other European countries. He has a large body of dedicated students in England, to whom he has given much of his time. 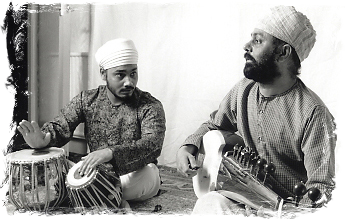 Gurdev Singh has to his credit many recordings, including with Viram Jasani (Sitar) and Ustad Latif Ahmed Khan (Tabla). Gurdev Singh is a constant companion with Ustad Harbhajan Singh Ji in performances of Gurmat Gurbani Kirtan in the UK. 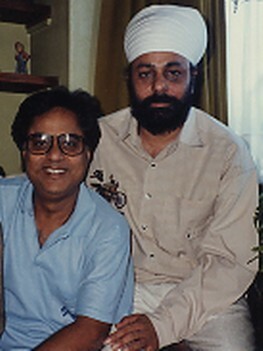 Gurdev Singh is very popular amongst all major Indian classical artists. The sarod was developed from the Rabab in the thirteenth century. Unlike the sitar, the sarod has no frets and its fingerboard is made of metal. The sound box is covered with skin. There are eight main playing strings and 11 to 16 resonating strings. It is played with a plectrum made from a coconut shell. The Sarod is an extremely demanding instrument to handle, partly because it is fretless. It is capable of an extraordinary range of sounds, from haunting sweetness to dazzling speed and power. Acknowledged throughout India as one of its foremost classical musicians and the maestro of his chosen instrument, the Sarod. Born in 1945 in Gwalior, where his father was a musician to the royal family, he made an early debut giving his first solo recital at the age of 12 in 1958. He represents the sixth generation of his family to inherit a classical tradition that goes back through his father, the late Ustad Hafiz Ali Khan to the era of the court musicians of the Mughal Empire and the original 'Senia-Beenkar' Gharana musical 'school' devoted to the tradition of the legendary Mian Tansen, Ustadji learnt the Sarod from his father. By visiting Pakistan in 1981, he was the first Indian musician to break the culture silence between the two countries. Ustadji has widely travelled and has played in China, the UK, the USA, Moscow, Germany and Japan. He is devoted to the cause of popularising Indian classical music through his performances over the AIR and T.V. In 1977, he founded the Ustad Hafiz Ali Khan Memorial Society which organises concerts and also has an annual Hafiz Ali Khan award bestowed on outstanding classical musicians in India and aboard. Ustadji is the recipient of many awards and honours - the Padmashree in 1975, the Sangeet Natak Academy award in1989, the Tansen Award in 1989, the Padma Bhushan in 1991 and the International Music Forum Award, Unesco in 1970, to name a few. More information is available Surnaad website.